Welcome back! Now that we have a better understanding of what causes the flu, this week we’ll talk about how to protect yourself and your loved ones from this illness. 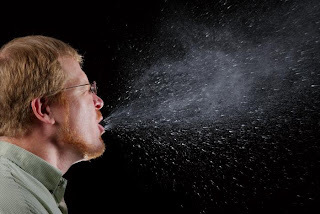 A little more background: The flu is spread when someone infected with the virus coughs, sneezes or talks. Droplets of saliva can carry the virus up to six feet away, as shown in the picture below. These droplets can land in the noses or mouths of people nearby, or they can land on surfaces, where people can unknowingly get the virus on their hands. Sneeze image courtesy CDC/ Brian Judd. 1. Get a flu vaccine. The flu vaccine is the best defense against the flu. Every year, scientists develop a new vaccine based on the type of flu viruses that are circulating. (Remember those fast-mutating strains we talked about last week?) The Centers for Disease Control and Prevention recommends that everyone 6 months of age and older get a flu vaccine. If you haven’t gotten your flu shot yet, it’s not too late! 2. Practice good hygiene. If the picture above made you want to wash your hands, that’s good. Regular hand-washing can help prevent flu and other infectious agents from entering your body. Be sure to use soap and water or alcohol-based hand sanitizer. You can read a lot more about good hand-washing technique on our hand-washing resource page. Making sure that you eat well and get enough rest can also help you to stay healthy. 3. Don’t be “that guy.” (Or gal!) If you do get sick with a flu-like illness, do everyone a favor: Stay home! Most people agree that if someone is sick, they shouldn’t come to school or work. But many people (64 percent, according to the National Foundation for Infectious Diseases) also admit to occasionally going about their daily activities despite being sick with the flu. Still thinking about going into work, despite your sneezing and fever? Consider this: People with the flu can be contagious for 24 hours before they have any symptoms, and might still be contagious for 24 hours after their fever goes away. And if you’re sick and have to cough or sneeze, remember to cover your mouth! 4. See your doctor if you have flu symptoms. Common symptoms of the flu include fever, cough, sore throat, runny or stuffy nose, body aches, headache, chills and fatigue. If you experience these symptoms, and especially if they start suddenly, make sure you seek medical attention. If you have the flu, your health care provider may be able to prescribe anti-viral medications that could help you get better faster. Not sure if it’s the cold or the flu? This fact sheet from APHA can help you tell the difference. And here’s another tip: Instead of running to the store when you get sick, how about stocking up on supplies beforehand? Here’s a list of what you’ll need. Thanks for joining us for Flu Fridays. We hope that you learned something to help you stay flu-free this year!